The Euro holds slightly positive tone in early Friday's trading and moved above trendline resistance (bear-trendline drawn off 1.1815 high, currently at 1.1364). 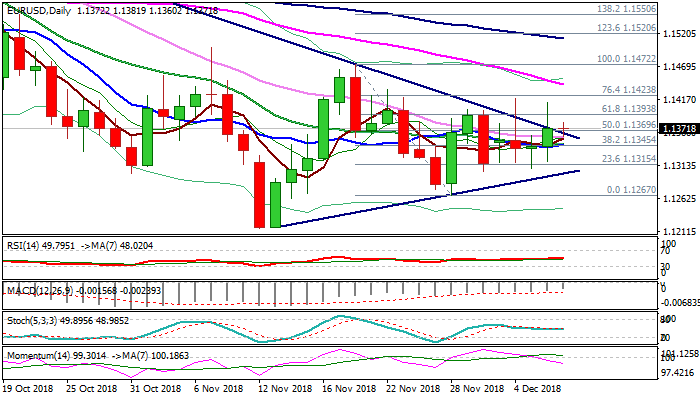 Bullish close on Thursday after triple-Doji and close above 30SMA (1.1359) were positive signals, although long shadows of Thursday's daily candle warn that the pair still lacks strength for stronger and sustainable action. Repeated failure to close above Fibo barrier at 1.1393 (61.8% of 1.1472/1.1267) despite spikes to 1.1418/12 (Tue/Thu) could be limiting factor, along with strengthening bearish momentum on daily chart. Weekly close above triangle's upper boundary would provide initial bullish signal, which needs confirmation on close above 1.1393 Fibo barrier. This would open way towards 1.1423/40 (Fibo 76.4% / 55SMA) and generate fresh bullish signal on break. Initial negative signal could be expected on break below converged 10/20 SMA's (1.1347) and higher base (1.1320) that would unmask triangle support line (1.1302). German Industrial Production fell well below expectations in Oct (-0.5% vs 0.3% f/c), with EU GDP (Q3 y/y 1.7% f/c vs 1.7% prev / q/q 0.2% f/c vs 0.2% prev) being the highlight of the European session. Top event today is release of US labor data. US Non-Farm Payrolls are forecasted to rise by 200K in Nov vs 250K previous month, while Average Hourly Earnings are expected to tick higher (Nov 0.3% f/c vs Oct 0.2%). Releases at/above forecasts would confirm strength of US labor market and boost dollar, fueling hopes for Fed rate hike in December, as markets reduced bets on rate hikes in 2019, on signals of global growth slowdown and potential escalation of US/China trade conflict.